Naval architecture also known as naval engineering, is an engineering discipline dealing with the engineering design process, shipbuilding, maintenance, and operation of marine vessels and structures. Naval architecture involves basic and applied research, design, development, design evaluation and calculations during all stages of the life of a marine vehicle. Preliminary design of the vessel, its detailed design, construction, trials, operation and maintenance, launching and dry-docking are the main activities involved. Ship design calculations are also required for ships being modified (by means of conversion, rebuilding, modernization, or repair). Naval architecture also involves formulation of safety regulations and damage control rules and the approval and certification of ship designs to meet statutory and non-statutory requirements. Hydrostatics concerns the conditions to which the vessel is subjected to while at rest in water and its ability to remain afloat. This involves computing buoyancy, (displacement) and other hydrostatic properties, such as trim (the measure of the longitudinal inclination of the vessel) and stability (the ability of a vessel to restore itself to an upright position after being inclined by wind, sea, or loading conditions). 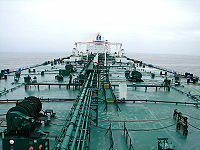 Deck of an oil tanker, looking aft. Structures involves selection of material of construction, structural analysis of global and local strength of the vessel, vibration of the structural components and structural responses of the vessel during motions in seaway. Construction depends on the material used. When steel or aluminium is used this involves welding of the plates and profiles after rolling, marking, cutting and bending as per the structural design drawings or models, followed by erection and launching. Other joining techniques are used for other materials like fibre reinforced plastic and glass-reinforced plastic. The aircraft carrier USS Kitty Hawk at Naval Station Pearl Harbor. Modern low-cost digital computers and dedicated software, combined with extensive research to correlate full-scale, towing tank and computational data, have enabled naval architects to more accurately predict the performance of a marine vehicle. These tools are used for static stability (intact and damaged), dynamic stability, resistance, powering, hull development, structural analysis, green water modelling, and slamming analysis. Data is regularly shared in international conferences sponsored by RINA, Society of Naval Architects and Marine Engineers (SNAME) and others. Computational Fluid Dynamics is being applied to predict the response of a floating body in a random sea. 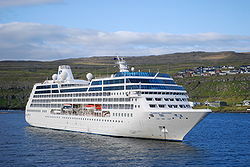 Wikimedia Commons has media related to Naval architecture. ^ American Society of Naval Engineers. Naval engineering brochure. ^ "Job Family Standard for Professional Work in the Engineering and Architecture Group, U.S. Office of Personnel Management, pp. 43–45" (PDF). This page was last modified on 13 April 2016, at 12:56.